Sitting with your feet flat on the floor with our backs resting on the back of your chair is an optimal ergonomic position (versus sitting on the edge of your chair as many shorter people end up doing so their feet can rest on the floor). However, many desks and computer surfaces are too high for people shorter than 5 feet 4 inches. At 5′-2″, I have always struggled to find the best combination of chair height and footrest to allow me to sit all the way back in my chair at my computer. Recently we tested out two of the footrests shown below. 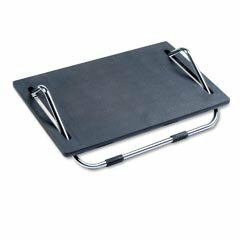 Our clients report that both the 8 inch high Safeco footrest and the Rubbermaid Footrest have really helped them feel less neck and back strain when they work. Two of our vertically challenged clients (one approximately 5′-3″ in height and the other 5 foot) are using the footrests to allow them to raise their chairs high enough so that they are in proper position over their keyboards AND can still rest their feet on the floor or footrest. Note: My feet are flat on a Safeco 8″ footrest myself as I type this post! This is a great footrest for people under 5′-2″. If you must raise your chair up to it’s upper most height just to get your hands comfortable on your keyboard, this is a footrest for you. It can sit flat so you can rest your feet flat as you sit. It can also easily angle if you need to rock your feet towards you or if you need a bit less height. • I had a very old rubbermaid footrest that finally cracked. Tried some out and wasn’t pleased. Decided to try this one, mostly because it was a bit higher than most others and i am short. I was skeptical because it ‘looked’ like it tilted ‘at will’ and wasn’t able to be set at one position. Well, that part is true but i just LOVE it and it is extremely comfortable whether tilted towards me or if i am resting such that it is tilted away from me! This one’s a keeper! • After reading the reviews posted, I decided to get this foot rest to help relieve my lower back pain. It has helped relieve my lower back pain considerably. I am only 5 feet tall and can never reach the floor. Having this has helped my posture and sitting position immensely. I cannot begin to tell you how this has helped my lower back. Thank you fellow reviewers for turning me onto such a wonderful product! 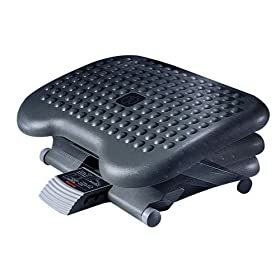 • I bought this for use at home with my computer… as a woman with short legs, even at the lowest setting my computer chair forces me to sit forward in order for my feet to be comfortably on the floor. This footrest is fully adjustable, tips comfortably and instantly relieved the pressure sitting at the computer, enabling me to work for longer periods of time with less back, neck and shoulder strain! Highly recommend you have one at home… I always had one at work but getting one for home was a great move! • This footrest is fairly simple but it gets the job done. Because the design is so simple, the likelihood of anything breaking on this is slim to none. I bought one for home and work and they both help me keep my legs up so that my legs aren’t getting pinched by the edge of the chair. I also like how you can adjust it by just moving your feet around which is nice for a fidgety person like myself. Note: This footrest is very high compared to other footrests. At its full height it is 8 inches from the floor. So for people taller than 5’4″ you may be better off with a shorter footrest, as shown below. 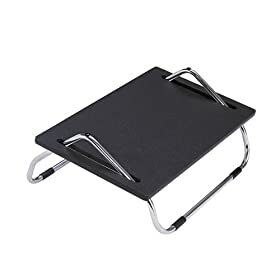 Amazon reviewers that were average height or only needed a footrest a few inches off the floor did not like this footrest due to it’s height. Elevates feet, improves circulation and allows shoulders to relax backwards naturally. Easy-Glide design improves circulation allows repositioning of legs and feet while footrest is in use. Tilt angle slides easy to any position that is comfortable for individual users. • There are fancier and more expensive foot rests out there, but they offer little more than an increased price and decreased reliability. This unit sturdy consisting of a metal frame and a solid (plastic or wood, I cannot tell) platform. It has only one moving part: the platform tilts in place on the metal frame. • I am 6′ tall and find this foot rest to be quite comfortable. It’s at just the right height to keep my posture straight when sitting at my desk in my office chair. The tilting feature is effective in allowing me to find a comfortable position, and allows me to change the easily position when I want as is recommended for maximum benefit. Changing position is done by simply moving the platform with the feet — it is held in position by friction which seems sufficient to prevent unwanted slippage, yet yields when required. • I looked at a lot of foot rests before choosing this one. The size is good, lots of foot room. I like that it can set over the cords rather than having to push them out of the way. It’s bulky or heavy and though it does not lock in place, it doesn’t move unless I want it to, I prefer it that way as I can’t sit in one position for long. • I looked at all the reviews on footrests first. This one had none; I went for it. All the others seemed to have some problem. It is not fancy, only two pieces. Little or nothing to break. It looks and feels sturdy. It does what is supposed to do: adjust to your feet-and-back-needs with a slight pressure with your soles. It stays in place until you change it. No wobbling. Rubber on the bottom has enough traction to keep footrest from slipping on hardwood floor. Feet don’t slip from rest surface, either. I started using it this morning. Very comfortable. My back feels better already. I recommend it. Note: Not every Amazon shopper was pleased with this Safeco footrest. But the unhappy reviewers main complaint was that the footrest broke when they applied too much pressure to it. Remember, this is a footrest, not a foot stool! Our 5′-3″ Working Well Massage client really likes this footrest. She’s only had it about a month so she can’t attest to it’d durability. However, it has made her much more comfortable sitting at her compute r and visiting coworkers like to putt heir feet on it under her desk when they come in for meetings as well. • I’ve had this for about 4 years and it works great. It is the only footrest you’ll find that goes to a full 6.25″ in height, so if you are 5’3″ or shorter, a standard footrest probably is not going to be high enough for you. If you are taller than about 5’7″, you could probably get a standard foot rest. This one is very solid, and while the height is not easy to adjust, I have needed to adjust it exactly one time–when I took it out of the box–unless your height fluctuates from day to day you’ll never have to change it. • I bought this to use at work and liked it a lot. However, one month later, it broke. A piece of plastic snapped off and now I no longer have three positions. Just one, flat on the floor. If you buy one, treat it gingerly and push it aside so no one else will use it when you’re away. • My husband and I both bought one Eldon Height-Adjustable Tilting Footrest for our offices. We were delighted at first, because it did seem to relieve back pain and adjust our sitting positions. However, a few months later, two piece of plastic which change positions snapped off on his footrest. I thought he was not gentle enough. Not long after that, mine broke too, just when I needed it most (pregnant women have achy back!) I swear I was very gentle, and with my husband’s experience, I was trying to be extra careful with it. Oh well. I will need to get another one. This time, I will buy one with metal support. • I am so happy with this product for several reasons – 1) Its the only footrest that I found that has 3 adjustable heights with the highest being almost 7″. This is great for me being only 5’2″! 2) It adjusts very easily…to raise it, just pull up to each height and to lower, hold the front and tilt it back. 3) It tilts back and forth, for added comfortability and increased circulation. The one thing I don’t like is the raised hard dimples. I know these are supposed to increase circulation in your feet, but I found them rather uncomfortable. I’m just beginning to write my book and I’m very concerned about the fact that I’m only 5’2″ and my desk is 36″ high. (My boyfriend built this beutiful desk for me and I love it…getting rid of it is out of the question). I only have a space for my chair that is (wall-to-desk) 16″ deep. I do have more room under the desk for my feet and legs and I do have my feet resting on a Rubbermaid footrest shown in the above article. MY QUESTION IS: “How high should my chair seat be in order for me to get my book written without doing damage to myself?” (as it is I have problems with my right shoulder). I really would love some help with this. Being 5′-2″ myself, I sympathize with your problem. However, there is not a set height for your chair that I can give you without seeing how you sit or what your desk height is. Even with all your dimensions, without seeing you and watching how you sit/work, it would be difficult to give you tips on your specific situation. So I will give you some guidelines to make it more comfortable for you to write your book. 1. You chair should be high enough for you to be able to rest your hands on the keyboard without bending your wrist backward. 2. Your chair arms should support your lower arms as you type. 3. If your chair is “too” high for you to rest your feet on the ground flat footed, invest in a footrest like I have mentioned in this post.They run about $30. 4. If your right arm has pain or injury, see a doctor to get a recommendation for either physical therapy, occupational therapy or massage to help you best heal from your injury. A good PT or OT should be able to tell you what you need to do at your workstation to avoid aggravating your arm pain. I hope that helps! Let me know what you come up with and how it is working for you! I like what you guys are usually up to. Such clever work and reporting! Thanks, Michael, for reading and commenting on our blog! Thanks for the thorough descriptions and recommendations. I purchased the Safco 8″ and look forward to testing it out. Glad that was helpful! Let us know how it works for you! Do these footrests fit between the spokes of a spinning desk chair? Whilst my footrest is too low for me, another problem is I also can’t get it close enough as it doesn’t fit between the spokes. Likely not. The spinning desk chair sounds intriguing! Maybe adding bike pedal pads or blocks to your chair pedals? IF the chair is like a recumbent bike. Would that help?